To think of what Ti West, known for making horror films, could have brought to the western if he'd been willing to push past the clichéd trappings of the genre. Instead he leaves his horror genre roots behind altogether. With In a Valley of Violence he attempts to transplant John Wick’s tale of a retired killer looking for revenge into a western setting. Yet despite how exciting that may sound, West turns in an uneven, unengaging film that lacks the ambition to create anything beyond a series of homages to the films that inspired it. In fact the setup is so similar to John Wick that it's hard not to be disappointed by how few thrills the second half of the film has in store. Paul (Ethan Hawke) is a former military man who may or may not have deserted his men, the film never makes it clear. But he’s clearly a killer trying not to kill anymore. His only possessions are his trusty horse, a rifle, and his incredibly well trained dog Abbie. After inadvertently getting into a fight with local gang leader Gilly (James Ransone), who also happens to be the son of the town's Marshall (John Travolta), Paul is asked to leave the town. Threatened may be the better word. Travolta delivers an intimidating speech about what he’d do to Paul should he find him or his dog anywhere near their town again. However the speech isn’t backed up by actions either witnessed or anecdotal. Paul does find one admirer in Mary Anne (Taissa Farmiga), a fast talking innkeeper with a lot to say, typically about her hatred of Gilly and his violent friends. She makes a few generic claims about their reign of terror, but again there’s no evidence of it. In fact all evidence points to these relatively few being the only inhabitants of the small town - we see no one outside of the central cast. It’s likely budgetary restraints kept this film’s ambition in check. While the small western town looks to have been a practically built set, they were likely left with little money for filling that town with people. Also cut from the film was Paul’s violent backstory, likely due to more budgetary constraints that kept West from rendering realistic looking Civil War battles. Instead the relatively few flashbacks we’re given are of Paul, in Civil War uniform, wandering around in the blackness of night. The rest of his backstory is hinted at in conversation rather than performed in flashback. The villainous gang here is made up of just four people, including the leader, and rather than being an intimidating mob, they tend to serve as comic relief. Their comic incompetence grants a chuckle now and then, but remains a far cry from the violent band that represses the people of the town as described by Mary Anne. When it's not channeling John Wick it's borrowing from Sergio Leone's spaghetti westerns (most noticeably in the red animated opening and closing credit sequences) or trying to inject some Tarantino-esque humor during some of the film's more tense moments. Instead of spaghetti, West serves up salad. A low calorie mix of ideas borrowed from better filmmakers. His hero is never convincingly setup as a skilled killer or given enough backstory to warrant our concern. His villains do a fair amount of talking but are never shown to be worthy of fear or intimidation even when they're clearly trying for it. And his attempts at Tarantino-esque humor - used to heighten a sense of character or tension - prove why Tarantino is such a rare and talented storyteller. West's attempts usually conflict with the drama rather than heighten it. There's also a drunken priest character - played by Burn Gorman - who continually pops up but never becomes important to the story. Gorman injects enough life into him in the opening scene that he might have made a far more interesting villain in this story if only West had had the foresight to allow it. Instead he and his repeated appearances are completely superfluous. For those intrigued by the notion of a wild west version of John Wick, be forewarned, with so few people in the cast, by the time the action does start heating up, we’ve already run out of people to kill. And West is far less creative about how he delivers on the relatively few action sequences. It also ends in nearly the same exact way as a certain other 2016 western featuring Ethan Hawke. Worse yet it never explores why Paul wanted to quit his violent ways in the first place, or once he had decided on violence, allowed for a sense of cathartic justice or poignant sadness in the fact that he had to sacrifice his decency in a corrupt world. West missed the important parts in what makes a good revenge tale good. 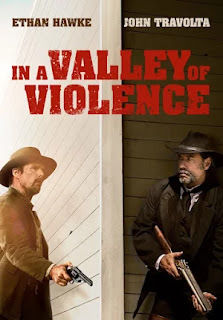 In a Valley of Violence is a shortsighted misfire in just about every way.